Robeast Scorpious may be one of the worst action figures ever made. He's from Panosh Place's Voltron line of toys. You know them, the company who made the OTHER voltron toys. Matchbox had the licence to use Popy's chogokin toys (Golion, Abega and Dairugger), and the rest went to a couple of companies that had no idea about what they were doing at the time. 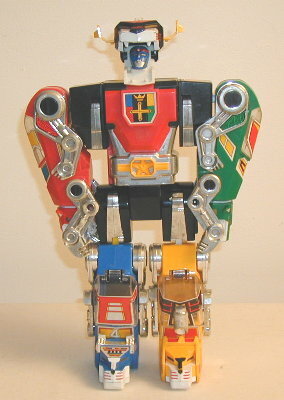 At least LJN came out with some cool toys, such as the Commander Voltron (adapted from the Japanese Golion Jumbo machine). Panosh Place pretty much destroyed the property. So the robeasts came with accessories, which I conveniently have lost for this review. Mutilator's weapon was a yellow mace. The sculpt is terrible, the material is terrible and the paint is terrible. There is just nothing to like about this thing at all. Imagine all the kids that were dissapointed when they got this under the tree in the 80s.